Captivate 2017 (v.10) was released a couple months ago. Check the helpful Adobe Forum for assistance and/or known issues. There is a lot to “Flash”. The Flash Player will finally be EOL’d at the end of 2020. So all of us who still have Flash *player* published content out there have about 2 years to get it migrated to a non-Flash solution. 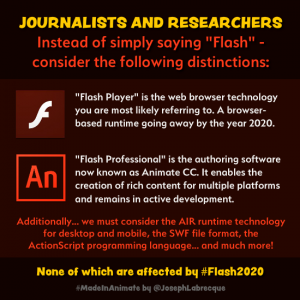 I think the above image is being a bit nitpicky but its a valid point, and a somewhat sore point for thousands of developers who spent years refining their Flash skills – and who struggle to find as an effective rich media development platform. Rustici is a reputable company with a lot of talented folks and deep involvement in eLearning standards such as SCORM and ‘TinCan’ (xAPI !). In fact, so thorough is their involvement and expertise, not only have quite a few other LMS products licensed Rustici’s engines but Adobe migrated Captivate’s entire SCORM (and probably xAPI) engine to Rustici’s implementation…and starting with Captivate 9, they included a specific publishing link to Rustici’s ‘SCORM Cloud’ site. I myself have recommended ‘SCORM Cloud’ countless times as a testing platform for developers’ eLearning content. 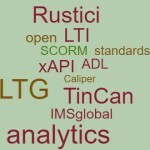 All in all, Rustici creates industry-leading API engines for the eLearning industry, no doubt. Kaltura is a provider of online video solutions and moving up in the world right along with video itself. We’ve worked with Kaltura fairly extensively over the past year and find its capabilities and features to be mostly excellent. There are, of course, a few areas to be improved…but the core video-streaming capabilities, to a variety of client devices, is simply solid. I try to be fair and/or somewhat agnostic in this blog, so don’t think of this promotion something specific only to Kaltura. There are other solid video providers out there (i.e. Panopto, MediaCore [now owned by Workday], Vimeo, etc. ), each with variations in toolsets, features, and focus… I just don’t have a lot of direct experience with most of them (well, maybe Vimeo a bit) and have been working deeply with Kaltura…plus, ‘open source’ is nice. Edit 3/14/16: Adobe has released an official update for Captivate 9. Most of you should be able to open Captivate and select Help > Updates to launch the Adobe Application Manager and select the release. For those of you who need an alternate method, you can download the patch from the CP Downloads page. See the Release Notes and this Adobe Blog post for more details on this rather extensive update, including new Responsive Skins, improved ‘Roundtripping’, and improved Rulers, Guides, and State options. As has been bouncing around the news, or at least relevant social headlines, the past few months – Adobe’s Flash product has undergone a significant makeover. Long doomed by many, considered ‘too proprietary’ or old or irrelevant in the current HTML5-is-our-saviour era…Adobe has taken steps to keep it alive. Welcome Adobe Animate CC. Too little, too late? Is it enough to overcome the flash-bashing trend (deserved or not)? The college tour dates started in mid-January, so check quickly to see if they’re coming to your campus or if you’ve already missed them. If so you can surely learn more at their University Recruiting page (and you can look for FT job opportunities there too). Adobe has recently been making a push to significantly improve the user experience of their community support resources (likely, at least in part, to Articulate’s excellent user-group support forum). Adobe’s relatively new ‘Community Connections‘ page is a add-on to their revamped product communities (i.e. 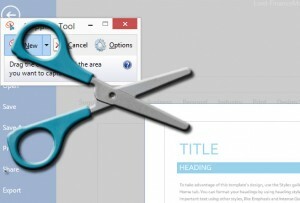 Photoshop, Captivate, and tons of other products).